The Route is the reaction of the Colombian popular and social movement to the announcement of official negotiations between the Colombian Government and the guerrilla army, the Armed Revolutionary Forces of Colombia (FARC), on the 4th of September 2012. The Route aims to articulate the different initiatives from within civil society that make possible a united movement for peace that does not allow this brave process to go backwards and that the aspirations of the Colombian people are at the centre of the negotiated solutions.  With this aim, the organizations that participate in this process meet twice a week to debate advances in negotiations and participation proposals, as well as to define activities in their own agenda that look to influence the talks between the government and the FARC. The day culminated in the Plaza Bolívar with musical acts and speeches by representatives of the participating organizations. It was carried out as part of the Week of Indignation- Unitarian Action of Organized Resistance and Struggle convened by three coalitions of organizations that were the driving force being the Social Route. These coalitions are the product of coordination work over the past few years which bring together numerous peace-building experiences and grassroots political alternatives. These are: the Congreso de los Pueblos; the Marcha Patriótica and the Coalición de Movimientos y Organizaciones Sociales en Colombia (Comosoc). Organizations like the Center for Research and Popular Education (Cinep) and the Inter-Church Justice and Peace Commission (CIJP) have supported rural community resistance processes in various parts of the country since the end of the 90s. These processes have led to the creation of the Peace Communities (like that of San José de Apartadó) and Humanitarian and Biodiversity Zones among others, which are initiatives by the civil population to demand respect from the different armed actors engaged in the Colombian Conflict for their territories, lives and work. Berenice Celeyta, president of Nomadesc association, expresses herself much along the same lines, Now, as before, the challenge is to give expression to a joint proposal that represents all parts of Colombian civil society. We have to acknowledge that there is a lot of diversity in Colombia and all the groups want something different. In any case, with dialogue we can identify these synergies. We start from the basis that we all want peace.  The Congreso de los Pueblos is an initiative born from the Social and Communitarian Minga that wants to launch the construction of a common legislation to mandate the future and present of our country with a Latin American and global perspective.  The organizations and movements that form part of the Congress are planning a large Congress for Peace for the coming year. In September of this year, various women´s organizations and initiatives also united to make up a space called Women for Peace in order to contribute to the peace process and gain our own voice for women.  Women for Peace includes organizations such as Corporación Humanas and movements such as the Ruta Pacifica de las Mujeres. The women´s movement has been developing over many years in different spaces such as the Council on Women and Armed Conflict in Colombia, and the Women´s Movement against War and for Peace. These movements and organizations, such as the Grassroots Women´s Organization (OFP) and Sisma Mujer, promote and defend the rights of women, youths and children and look for solutions to the armed conflict in Colombia at a local, national and international level. PBI accompanies organizations and people who for years have promoted the initiatives of the social and political movement in support of the transformation of society and the construction of peace. 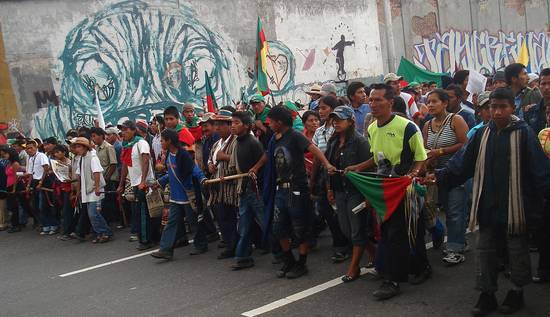 Organizations like Nomadesc, the Peasant Farmers Association of the Cimitarra River Valley, the Committee in Solidarity with Political Prisoners, the Inter-Church Justice and Peace Commission, the José Alvear Restrepo Lawyers Collective and many others are under the permanent risk of being threatened, displaced, prosecuted and even killed. They fight against impunity, extrajudicial executions, forced displacement and disappearance, dispossession of land, sexual violence against women due to the armed conflict; and they fight in favour of truth, justice and the comprehensive reparation to victims of these and other such expressions of Colombia´s violence. They are organizations that promote grassroots organizational initiatives, local peace initiatives, economic alternatives and food security or the exercise of their rights.